Bottom line: G.Skill's Trident Z memory gets a new look but keeps performance intact. The crystals and RGB offer a unique look that could fit into a build fit for a king or queen, but may not be the look everyone is interested in. G.Skill is introducing a new variant to its well respected Trident Z series. This time around, the Trident Z Royal arrives with crystals along the RGB bar of lights. Trident Z Royal DDR4 memory will be available in frequencies starting at 3000MHz ranging on up to 4600MHz. When it comes to memory, there are few specifications to truly worry about unless you are looking to perform some extreme overclocking. So long as your motherboard and processor pair plays nicely with the memory timings, there is little else to take note of aside from having official support from the manufacturer. 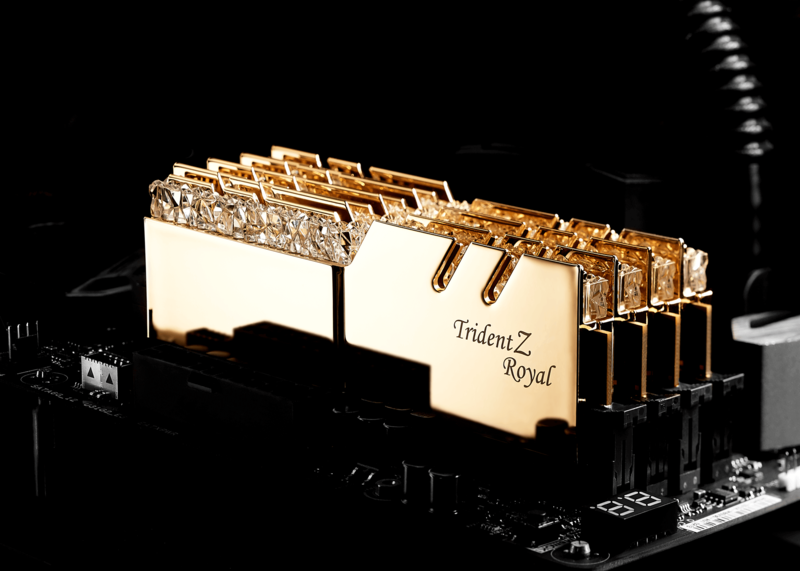 The Trident Z Royal DIMMs are available in both gold and silver. Support for XMP 2.0 profiles is intended to allow for one-click overclocking. For those interested in overclocking or just want to see the raw numbers, see the list of timings and voltages versus frequency below. Trident Z Royal will become available in December 2018 from G.Skill's distribution partners. Pricing is not yet available but expect to see a slight premium over the original Trident Z RGB memory.